Background: Sickle cell leg ulcers (SCLUs) are a major chronic debilitating complication in patients with sickle cell anemia (SCA). These ulcers lead to stigmatization and depression. Zinc deficiency has been implicated as a cause of SCLU. This study determined the predictability of leg ulcers and zinc levels among SCA patients in Zaria. Methods: This was a case–control study in which 100 participants (50 patients with HbSS and 50 controls with HbAA) were enrolled over a 3-month period by convenience sampling technique. Semi-structured questionnaires were used to obtain participants' ages, gender, and presence or absence of leg ulcers. Serum zinc levels were assayed using spectrophotometry. Data obtained were analyzed using IBM SPSS software version 20.0. Means and standard deviations were used to summarize the data, independent sample t-test was used to compare means, and logistic regression was used to assess whether zinc levels can predict the prevalence of leg ulcer among patients. P ≤ 0.05 was considered statistically significant. Results: The mean age of the participants was 24.92 ± 6.2 years while that of the control was 22.92 ± 4.9 (P = 0.172) with a range of 18–42 years in both groups. Leg ulcers were present in 10/50 (20.0%) of the patients with SCA. 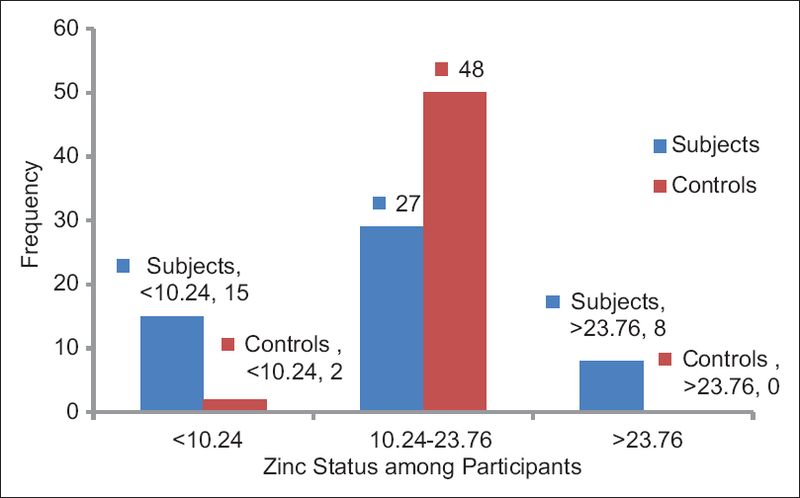 The mean zinc levels of patients with SCA with and without leg ulcers were 12.0 ± 4.0 μmol/l versus 15.5 ± 7.4 μmol/l (t = 2.060, P = 0.050). A binary logistic regression model using zinc as a predictor could explain only 4.7%–7.5% of the variability in leg ulcers but did not improve classification of cases. There was a negative nonsignificant association between zinc levels and leg ulcers, B = −0.098, odds ratio = 0.906, 95% confidence interval (0.789, 1.042), P = 0.167. Conclusion: Serum Zinc level is a poor predictor of leg ulcers in patients with SCA, thus suggesting other yet unstudied factors as likely better predictors. Background: Lead is one of ten chemicals of key public health concern. It inhibits various enzymes in the synthesis and homeostasis of red blood cells, hence altering hematologic parameters in those chronically exposed. Aim: This study aims to assess the degree of lead exposure among battery lead repair workers in Lagos and relate it to their hematologic profile. Materials and Methods: Structured interviewer-administered questionnaires were used to record demographic data. Blood samples were taken to determine full blood count, erythrocyte protoporphyrin, serum ferritin, and blood lead levels (BLL). BLLs were determined by atomic absorption spectrometry. BLL were categorized as mild, moderate, or severe and were related to hematologic parameters. Categorical data were presented as proportion and continuous data as means or median. The effects of personal protective equipment on BLLs were assessed. Results: A total of 66 men with the mean age 46.15 ± 11.73 years and average duration of exposure to lead of 23.33 ± 11.03 years were enrolled. The median BLL was 20.75 μg/l (interquartile range). Majority had BLL between 20 and 40 μg/l, 4.55% had severely elevated lead levels. Participants with >30 years of exposure had a higher BLL (P = 0.046). BLL was negatively correlated with RBC count (r = −0.322 P = 0.008) and positively correlated with mean cell volume (MCV) (r = 0.277 P = 0.025). Mean MCV was 86.39 fl ± 7.90 fl). Participants with BLL >40 μg/l had higher MCV (P = 0.038). Conclusion: Battery repair workers have moderate exposure to lead which is not enough to lead to significant hematologic effect. Introduction: The major obstacle to developing sustainable services in a resource-limited setting, which hitherto has not had routine availability of diagnostic immunohistochemistry (IHC), is choosing from a large array of over 200 antibodies that are currently in use in the Western world. 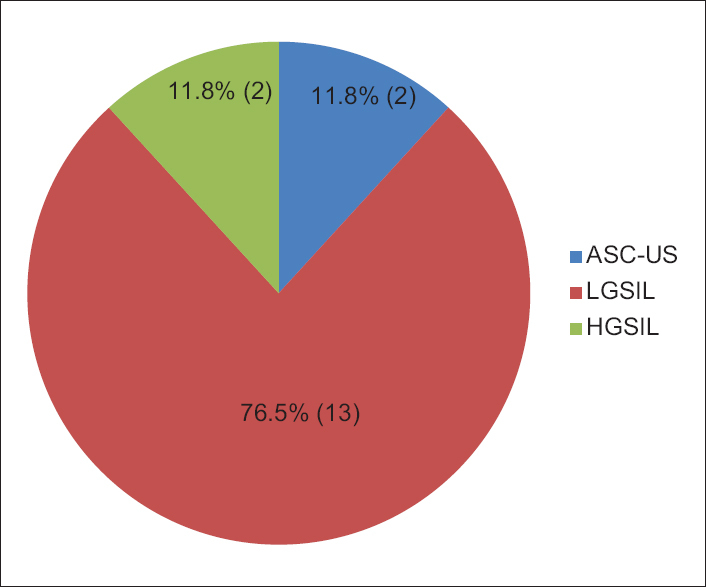 Materials and Methods: By critically analyzing the use of diagnostic IHC in a cohort of 360 cases sent for consultation from Nigeria to the UK between January 2014 and May 2016, we have derived a list of antibodies that could meet over 85% of current diagnostic IHC needs in Nigeria. Results: From our analysis, a starter list of only two antibodies could immediately meet over 30% of the IHC needs. Having mastered this starter list, the service could move to the next step by adding 23 other antibodies which could meet another 85% of diagnostic IHC needs. Conclusions: Testing with these 25 antibodies can be done at least twice weekly to address the 3 areas mentioned above and greatly increase the chances of success in establishing a sustainable service. We recommend this list to the various groups working with diagnostic IHC in Nigeria and look forward to reports of their efforts. Background: A group of diseases related to normal or abnormal gestation that have a common denominator, the abnormal proliferation of trophoblast tissue, are generically designated gestational trophoblastic diseases (GTDs). Individual disorders differ remarkably in their appearance (morphology) and clinical significance. 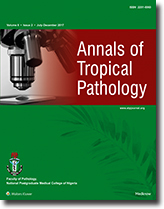 This study was aimed at characterizing all cases of histologically diagnosed GTDs, seen at the Histopathology Department of the Jos University Teaching Hospital (JUTH). 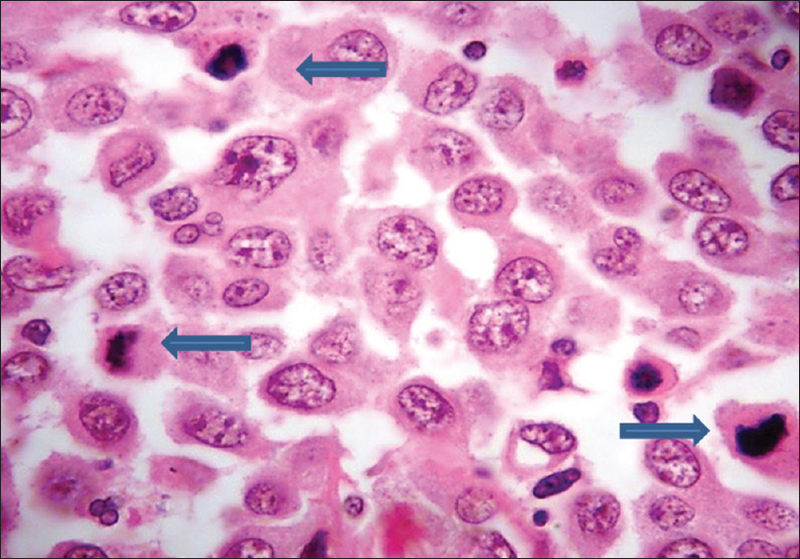 Materials and Methods: This study was a 10-year hospital-based retrospective study employing slides and tissue blocks of specimens from uterine evacuation products of gestations of all females diagnosed with GTDs in the Histopathology Department of JUTH from January 2004 to December 2013. The materials used in the study included records from the departmental registry and archival slides and tissue blocks from the archives of the histopathology department of the hospital. Results: A total of 151 cases were diagnosed histologically as GTDs, during the period under review. These accounted for 0.8% of all the surgical pathology specimens received. A total of 151 cases of GTD histologically diagnosed met the inclusion criteria and translated to 5.7 cases/ 1000 pregnancies. The following histological subtypes were seen: 63 cases (41.7%) were diagnosed as partial hydatidiform mole (PHM), 42 cases (27.8%) were choriocarcinoma, and 35 cases (25.8%) were diagnosed as complete hydatidiform mole. 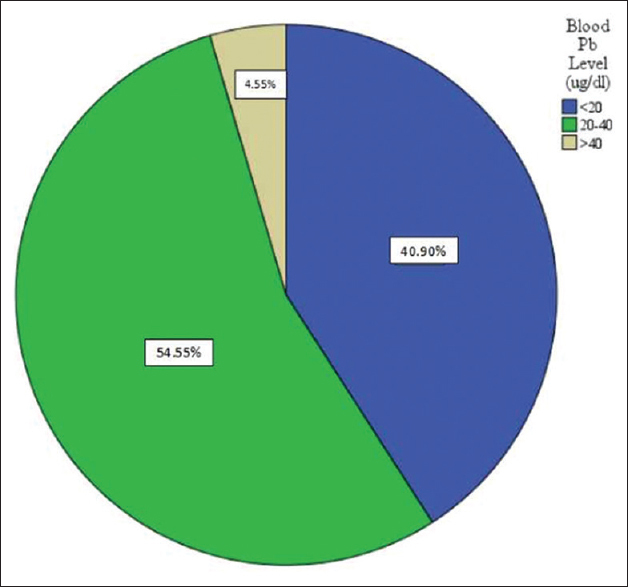 Four cases diagnosed as invasive mole accounted for 2.7%, which is closely followed by 3 cases of placental site trophoblastic tumor, accounting for approximately 2% of GTDs. However, no case of epithelioid trophoblastic tumor was seen. Conclusion: GTD was found to be common in Jos and had a frequency of 5.7 cases/1000 pregnancies in our series. The most common histological subtype was PHM, closely followed by choriocarcinoma. The molar lesions peaked in the second and third decades, while choriocarcinoma peaked in the second decade of life. Background and Objectives: Cancer is an increasing problem in Africa. This study analyzes the profile of cancers recorded in the second decade of Kano cancer registry (KCR), and compare data with a similar previous 10 years (1995–2004) study in the registry to detect changing patterns. Materials and Methods: Cancer cases received by the registry from January 2005 to December 2014 were retrieved from the records and classified by organ/sites of affectation in accordance with the international classification of diseases for oncology. The data are presented in tables according to the organ/sites and ranked accordingly. Results: A total of 47,734 specimens were received within the study period out of which 6548 (13.2%) were malignant. The malignant cases comprised 3598 (54.9%) females and 2950 (45.1%) males (f: m = 1.2:1); there were 516 (7.9%) Paediatric cancers in the series. Overall, breast cancer (14.1%) was the most frequent followed by cancers of the cervix (11.1%), prostate (10.9%), nonmelanoma (nm) skin (7.3%), and colorectum (7.2%), respectively. The leading six cancers among females were the breast (25.0%), cervix (19.8%), colorectum (6.8%), connective tissue (6.6%), nm skin (6.5%), and uterus (5.7%). The corresponding ones in the males were prostate (24.7%), bladder (10.9%), nm skin (8.2%), colorectal (7.8%), connective tissue (7.5%), and eye (4.8%) cancers. Retinoblastoma was responsible for more than half of all Paediatric cancers (61.4%). Conclusion: This study detected some change in the pattern of cancers in KCR. More females than males are affected, and breast cancer is the most common malignancy among women. This contrasts with the previous study which showed male predominance and cervical cancer as the commonest malignancy in women. Prostate and bladder cancer still remain the most common malignancies in men. Data from this study will help to further focus efforts and resources toward tackling the most prevalent cancers in our region most of which are potentially preventable. Background: Cervical cancer is one of the most common cancers in women. Human papillomavirus (HPV) infection is the primary cause of virtually all cervical cancers. Cervical cancer typically develops from precancerous changes, squamous intraepithelial lesion (SIL) over a period of 10–20 years, in about 5%–10% HPV-infected individuals. This study was carried out to determine the prevalence and risk factors of SIL among women in Kaduna State, Nigeria. Materials and Methods: This study was a hospital-based and cross-sectional study that combined the use of a structured questionnaire and analysis of cervical scrapings samples obtained from 276 consenting women in Kaduna State, Nigeria. The samples were analyzed for SIL using conventional Papanicolaou smear. Results: The prevalence rate of 6.2% for SIL was obtained with low-grade SIL being the most common type of cervical abnormality. Sociodemographic factors associated with the development of SIL in the study were marriage type, level of education, and occupation (P ≤ 0.05). The risk factors that were associated to the development of SIL in the study were multiple sexual partners and high parity (P ≤ 0.05). The symptoms associated with SIL were intermenstrual bleeding, dyspareunia, and postcoital bleeding. Conclusion: The prevalence of SIL obtained from this study is appreciable, and this calls for the institution of awareness programs for HPV-associated cervical cancer and the implementation of a routine cervical cancer screening program in Kaduna State, Nigeria. Background: Epstein–Barr virus (EBV) has a consistent global association with nasopharyngeal carcinoma (NPC). The detection of EBV in NPC has been shown to have diagnostic and prognostic importance. Latent membrane protein-1 (LMP-1) immunochemical staining is a well-recognized, rapid, and effective method of EBV detection. This study aims to determine the EBV status of NPC seen over 22 years, from 1992 to 2013 in Ahmadu Bello University Teaching Hospital (ABUTH). Materials and Methods: It was a retrospective study of all NPCs diagnosed at the Department of Pathology, ABUTH from January 1, 1992 to December 31, 2013. The paraffin-embedded tissue blocks of all histologically diagnosed NPCs within the study period were retrieved and examined. Cases in which the tissue blocks were missing, badly damaged, or had insufficient tissue were excluded from the study. Histopathological diagnosis was in accordance to the 2005 World Health Organization classification. EBV detection was done using immunohistochemistry (IHC) for EBV LMP-1. Data were analyzed using SPSS 24. Fisher's exact test statistic value is 0.545, which is not significant at P < 0.05. Results: A total of 112 NPC cases were histologically diagnosed, 66 (58.9%) of these were available for EBV LMP-1 IHC and 46 (41.1%) were excluded. EBV LMP-I IHC was positive in 51 samples (77.3%), while 15 (22.7%) were negative. There were 63 (95.5%) cases of nonkeratinizing carcinoma (NKC) seen, of which 49 (77.8%) were EBV positive and 14 (22.2%) were negative. Keratinizing squamous cell carcinoma (KSCC) constituted 3 (4.5%) cases, 2 of which were EBV positive (66.7%) and 1 was negative (33.3%). No basaloid squamous cell carcinoma case was available for the study. Conclusions: There is a high prevalence of EBV in NPC. However, there is no statistical difference in the prevalence of EBV in NKC and KSCC. NPC showed an association with EBV irrespective of histological type. LMP-1 IHC has proved useful in detecting EBV in NPC in this study. Background: Histologic grade of breast cancer is a Category I prognostic factor. Thus, accurate and reproducible grading must be ensured by periodic auditing and training. Objective: The objective of this study is to audit interobserver agreement in grading and evaluate agreement of grading on core needle biopsies with surgical pathology. Materials and Methods: Slides of 73 cases of invasive carcinomas of the breast were retrieved from archives. These were grouped into 43 cases on which consensus grades assigned by 3 pathologists were compared with initial grades assigned to the cases. The next 24 cases were graded independently by 4 pathologists and compared. In the last 6 cases, consensus grades were assigned to both the initial core needle biopsy (CNB) and the excisional biopsy. Kappa values were then calculated. Results: Kappa value (κ) for the first 43 cases was 0.50 (moderate agreement; P < 0.05). There was only fair agreement (κ = 0.25) between CNB grade and final surgical pathology grade, with 50% being upgraded from Grades 2–3. 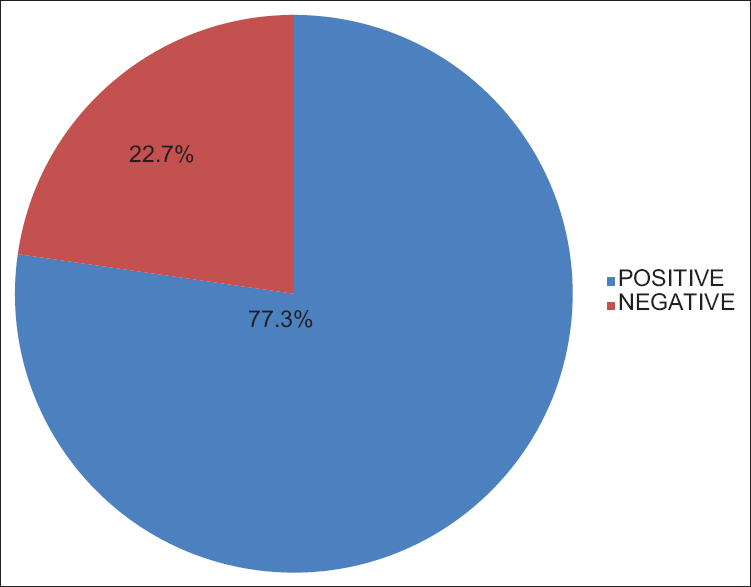 There was moderate agreement (κ = 0.53, P < 0.05) in the 24 cases on which inter-rater agreement was tested. Specific rating of both mitotic count and nuclear pleomorphism showed fair agreement (κ = 0.25 and 0.34, respectively) while rating of tubule formation showed moderate agreement (κ = 0.57; P < 0.05). Pairwise kappa agreement ranged from fair to good (0.31–0.63). Conclusion: To ensure reproducibility, greater attention should be paid to accurately assessing nuclear pleomorphism and mitotic activity in particular. Re-grading of excisional breast biopsies after initial CNB is also essential to prevent undergrading. Background: Male breast cancer is a rare disease that is not well characterized and accounts for <1% of breast cancer incidence and <1% of all male cancer cases. It also carries a significantly higher mortality rate when compared with the breast cancer in female patients. The notion that men could also be afflicted with breast cancer is apparently not widely perceived. The aim of this study is to evaluate the incidence of male breast cancer cases in a tertiary hospital in North-Western Nigeria. Materials and Methods: Over a 10-year period (January 2006 to December 2015), all hematoxylin and eosin-stained sections of biopsies from male breast clinically diagnosed as cancer (mastectomies and biopsies) were retrieved from the departmental archives and reviewed to confirm the initial diagnosis. Clinical biodata were obtained from patients' request forms and histology register. Data obtained were analyzed using the Statistical Package for the Social Sciences (SPSS) version 20 and presented as simple frequency tables. Results: There were a total of 33 male breast cancer cases histologically diagnosed during the study period. 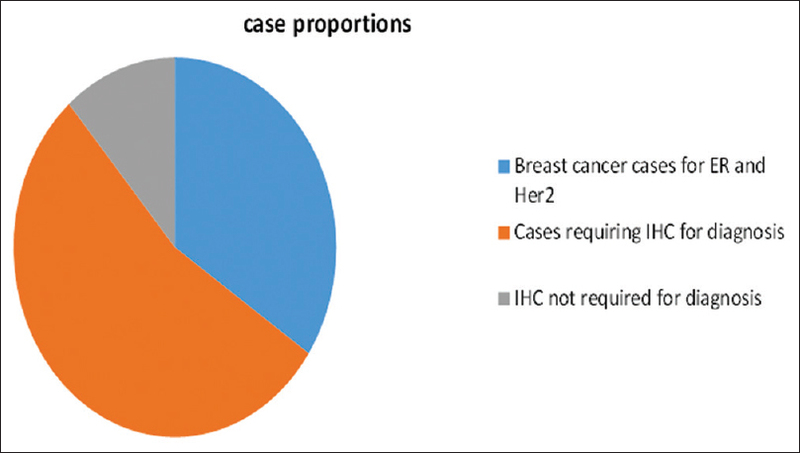 This constituted 4.3% of all breast cancer cases in the period. The mean age was 49.7 years with standard deviation ± 17.3 years and age range of 20–99 years. The results revealed that 14 (42.4%) patients had right breast cancer, followed by left that accounted for 10 (30.3%), bilateral 5 (15.2%), and side unspecified 4 (12.1%). With respect to histologic types, 30 (90.9%) of cases seen were invasive carcinoma no special type (NST) while lobular carcinoma accounted for 2 (6.1%), and mucinous adenocarcinoma was 1 (3.0%). Conclusion: This study showed males in our environment do suffer from breast cancer albeit in a small proportion and that invasive carcinoma NST was the most predominant histological variant of male breast cancer cases in our region. Objectives: In every population, the pattern of sudden unexpected natural deaths (SUNDs) is often associated with the epidemiologic profile of certain common killer diseases. The old narratives have been that infectious/communicable diseases are the most common reasons why people die in our locality. However, changing lifestyle, increasing literacy level, and urbanization in Nigeria must have impacted immensely on the causes of death. We, therefore, embarked on this study to determine the etiology and epidemiologic characteristics of SUND at Benue State University Teaching Hospital, Makurdi. Materials and Methods: A review of all cases of sudden unexpected deaths at Benue State University, Makurdi, Benue State, over a 5-year period, from March 2012 to February 2017. Results: A total of 125 medicolegal autopsies were performed over a 5-year period (2012–2017), 58 (46.4%) represented SUND. Thirty-five (60.3%) cases of SUND were due to cardiovascular disorders, comprising 26 males and 9 females with a male-to-female ratio of 2.9:1, while twenty-eight (80.0%) cases those who died from cardiovascular disorders were due to hypertensive heart disease. Twelve (20.7%) cases classified as SUND were due to central nervous system disorder, eight males and four females, having male-to-female ratio of 2:1. The remaining 11 (19.0%) cases of SUND were due to respiratory diseases comprising 9 males and 2 females with male-to-female ratio of 4.5:1. Conclusion: Cardiovascular, central nervous system, and respiratory disorders were the major causes of SUND. Systemic hypertension-related disorders constituted a large proportion, especially in the middle age group. Introduction: Pre- and post–assessment examinations are invaluable to evaluate the knowledge base of participants in educational programs or workshops. It is plausible that there is no significant effect on the knowledge base of participants at the end of the hands on workshop. The aim of this study is to test this hypothesis by determining the effect of the hands-on workshop on the knowledge gained by the participants. Materials and Methods: This was a retrospective study. The targets were all participants who partook in both the pre - and post-assessment examinations of the hands on workshop on museum and plastination techniques, organized by the National Postgraduate Medical College of Nigeria (NPMCN), held from, 21st to 25th of August, 2017. The effect of the hands-on workshop was tested, using self-pairing of data obtained from the scores of the pre- and post-test assessment. The self-paired data were analyzed with the Statistical Package for Social Sciences, version 16 (SPSS 16, SPSS Inc. Chicago, Illinois, United States of America) using the paired t-test, with the level of statistical significance set at P ≤ 0.05. The critical t value was obtained from the tables of critical values of t distribution at P = 0.05 and the degree of freedom (df) = n-1, where n is the sample size. Result: The result showed a substantial increase in the knowledge gained by the participants. Statistically, there was a significant difference between the mean percentage pre- and post-assessment test scores at P = 0.03 for museum techniques, P ≤ 0.0001 for plastination techniques and P ≤ 0.0001 for the overall assessment. Discussion: This workshop has significantly improved the knowledge of participants in museum and plastination techniques, hence, we reject the aforementioned hypothesis. Conclusion: It brings to fore the usefulness of hands-on techniques in passing knowledge from tutors to tutees. 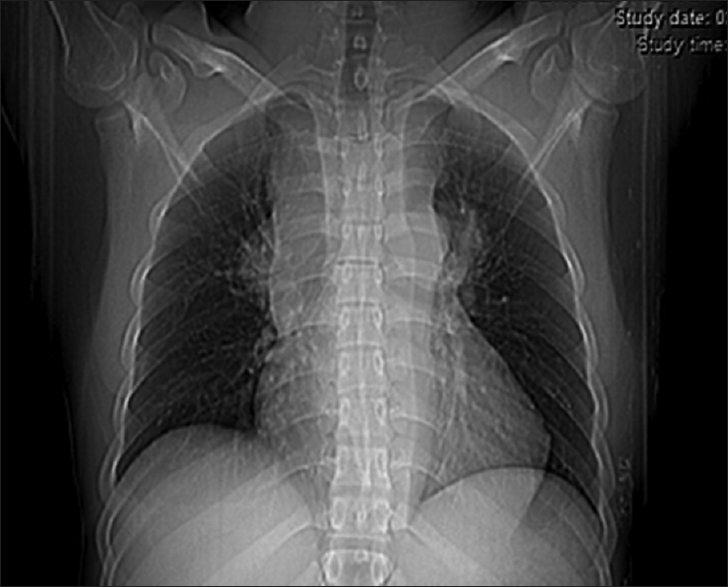 AUJ was a 29-year-old male student who presented with a 4-month history of cough, vomiting, headache, distended neck veins, dysphagia to solid meals, and recurrent episodes of dyspnea. Physical examination revealed right supraclavicular soft-to-firm nontender mass with no palpable thrill. The superficial veins of the face, neck, and chest were dilated. Chest computed tomography (CT) scanogram showed widened mediastinum with a lobulated soft-tissue mass seen at that region, compressing the trachea, bronchi, and superior vena cava. The anterior mediastinal mass was lobulated and showed heterogeneous density with minimal contrast enhancement. It was complex mixed echogenic on ultrasound with no remarkable color signal changes on color Doppler interrogation. 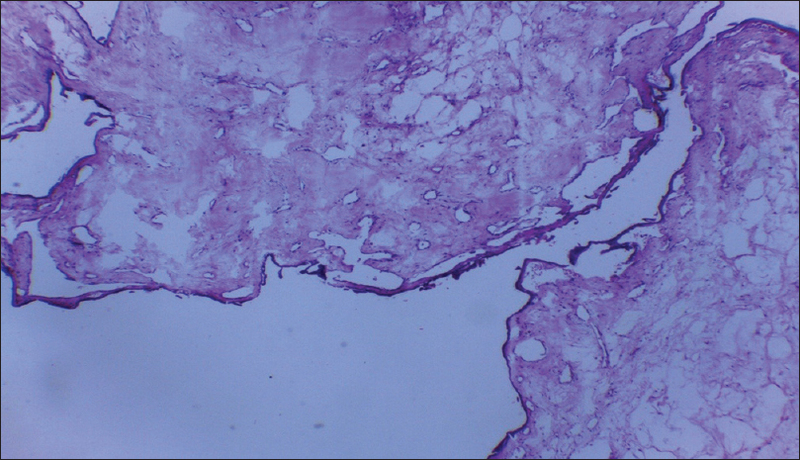 A diagnosis of anterior mediastinal mass, most likely thymoma with superior vena cava syndrome, was made. CT-guided biopsy confirmed the diagnosis of malignant thymoma. He was slated for debulking surgery, and this was to be followed by radiotherapy and/or chemotherapy. At the time of intubation during anesthetic procedure, however, he developed cardiac arrest and died on the 15th day of intensive care management. Kaposi sarcoma (KS) has different clinicopathological presentations, an uncommon form of which is pyogenic granuloma (PG)-like Lesions. This may make its diagnosis challenging, due to its clinical and histological features of both PG and KS. These skin lesions are superficial and protrude outward with subsequent ulceration and secondary infection giving the appearance of a PG. It has been reported in HIV-negative and HIV-positive KS patients. We report a 37-year-old HIV-positive patient on highly active antiretroviral therapy with multiple flesh-coloured skin growths, after initial clinical evaluation, a diagnosis of PG was initially made, however, skin biopsy of the growths revealed KS. We report this case because of rarity of this clinicopathological variant of KS, to which most clinicians misdiagnosed as PG (a benign lesion) with antecedent consequences of delayed treatment. Thus, there is a need for clinicians to do early tissue biopsy of skin growths in HIV/AIDS subjects in order not to miss this rare variant of KS.